Any land crossings into Myanmar require you to have your visa already in your passport; e-visas are not valid. Your Passport must be valid for at least another six months on your day of entry into Myanmar. 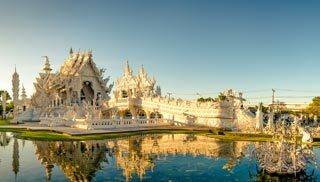 Check out the Thailand articles section for information on getting a Myanmar visa in Thailand and visa runs. NOTE: Myanmar time is minus 30 mins (UTC +6:30) of Thailand (UTC +7:00). Border 1 – Mai Sai (Thailand) / Tachileik (Mynamar) – Open 8:00am to 6:00pm The border town of Mae Sai is right next to the border, so you can get a bus from nearby towns such as Chiang Rai and Chiang Mai to Mai Sai. The bus station is not in the centre of town, but there are red songthaews waiting at the station to take you to the main street for 15B. The border is just near the main street and you can walk down to it. It’s an easy stamp out of Thailand, the short walk across the bridge to an easy welcome to Myanmar at immigration. You can head further into the Shan State; there’s a decent road connecting to Kentung but as a foreigner, you still can’t head much further into the state by land. Air Yangon and Air Bagan operate regular flights to Mandalay and Heho.